In an era of constant communication, most PR agency experts will say that silence is rarely an option in the wake of controversy. In times of trouble, a “no comment” may be seen as a sign of guilt, indecision, or apathy. PR experts sound the alarm about the communication vacuum in such cases, worried that damaging or inaccurate chatter will fill the void and they’ll lose control of the narrative. Often, they’re right. 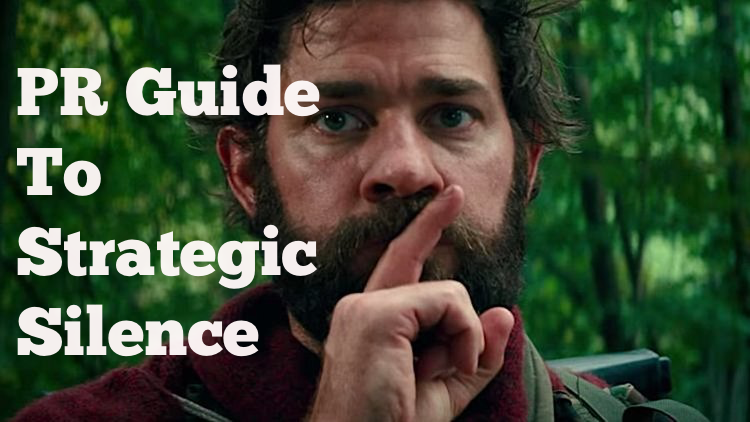 But there are some scenarios where strategic silence is the most sensible path. It may be unnecessary or even counterproductive to join the fray when brand ambassadors, or regular customers, are already on the case. This is particularly true when the criticism is questionable. In 2015, Starbucks was accused of being part of a “war on Christmas” when it unveiled plain red holiday cups. An activist’s video garnered 13 million views and launched the hashtag #MerryChristmasStarbucks. Starbucks wisely didn’t engage the activist, nor did it post in its own defense. It had plenty of defenders who fired back on social platforms with #JustaCup, including celebrity influencers like Weird Al Yankovic, Demi Lovato, and Stephen Colbert. Strategic silence was the best course of action here, because any interjection by the brand would have probably amplified the negative attention and fueled greater criticism. Another occasion where it doesn’t pay to engage with critics is when they’re minor players, crazy, or both. Any significant social response may serve to elevate or dignify a nutty claim, while silence preserves the brand’s standing by rising above trolls and cranks. This means that a customer service or PR team must recognize the difference between an anonymous troll with a miniscule following and a legitimate customer or influencer. It’s where experience and good judgment come into play. On the flipside, there are some critics who aren’t worth engaging because they command a bully pulpit. In April, a presidential Twitter tirade against Amazon helped the company’s share price plunge 11% in one week. Though CEO Jeff Bezos has fired back at the president in pre-election social showdowns, he abstained from a public kerfuffle this time. This was a defensible move, in part because Trump’s every tweet will be magnified in the mainstream media. Then, too, the news cycle is rapid, and this president tends to move on quickly to other issues. Silence was a reasonable tactic here. Crisis-management best practice calls for an immediate response where a brand or personal reputation is on the line. But, temporary strategic silence is sometimes necessary for a company to offer an accurate response. For example, Facebook CEO Mark Zuckerberg waited five days before giving TV interviews and issuing apology statements about the Cambridge Analytica controversy. That’s far from an ideal scenario, but sometimes rushing in without facts is worse. Most analysts criticize Zuckerberg’s tardy and inadequate response as a PR misstep. Without question, its image has been tarnished by its own conduct, and the response didn’t help. Yet if a company speaks before it has all the information, it risks inflaming the crisis, or, worse, inviting legal liability. Where silence is unavoidable, a statement that acknowledges the problem and pledges to get to the bottom of it is a logical starting point. This is particularly true when the situation is as legally and technically complicated as the data privacy scandal. Sometimes a company has a well crafted public position on a controversial topic but chooses not to comment on a relevant development for SEO reasons. A beverage alcohol brand may lead a campaign against underage drinking – motivated by the halo that comes with such an effort. That’s laudable. But for the same company to comment on a congressional investigation into marketing to minors might forever link the brand to that inquiry. Even though it’s on the right side of the issue, its brand will turn up when any journalist researches the topic for a story or follow-up. This is where third-party advocates or industry trade associations come in handy, because they can speak for the individual players without having any brand or company be front and center in the public discussion. While it goes against a basic tenet of good public relations, silence beats a hasty, half-baked response that can be seen as tone-deaf, premature, or insincere. The trick is to use it sparingly, and only as a prelude to responsible engagement.